If you had frozen your pork roast leftovers then the last 2 posts would not be a good option for you as those are best for leftover pork roast which is in between a day up to a maximum of two days old, any older than that the meat would dried up and it would not taste good. This post would only be your best bet as it brings back the moisture lost. It is a popular dish in buffets in the Philippines and its called roast in mushroom gravy, commonly beef is used but for today we will be using those pork today leftovers we still have. This dish is not just excellent in using the leftover pork; it even uses the left over gravy. In a heavy pan, add butter then sauté onions until soft. Add mushrooms and cook for a minute. Add the gravy, cream of mushroom and roast pork, bring to a boil then simmer for 5-10 minutes. wow. That’s such a simple yet delicious looking recipe!!! Great little quick after work comfort food. Now if I could just get my teenage boys to leave some leftovers….. This is a great way to use up leftover pork! My family would love this. You do this same dish with beef as well with no changes? Reymund I just cant believe that this dish is made from leftovers, looks absolutely amazing my friend! Hugs! 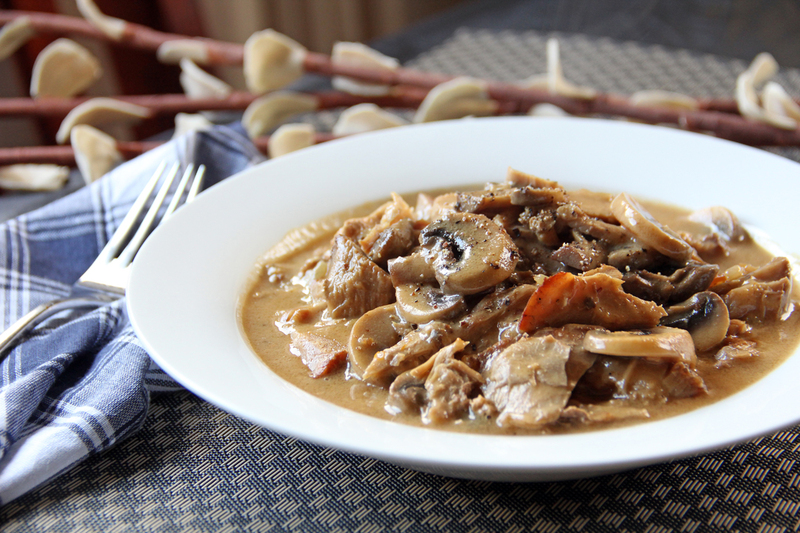 What a tasty way to serve up leftovers – love mushrooms sauce from than anything else! I’d love to eat this kind of dish on cold nights. Looks yummy, Raymund! I’ve never made mushroom sauce at home before. Something I must do in the near future. I always cook the Thanksgiving dinner and then my other family members trade off on hosting Christmas. I may have to request that they make the other recipe so I can get the leftovers and make this! love mushrooms sauce from than anything else! Something I must do in the near future. Thanks you!